One evening a Cherokee Indian told his grandson about a battle going on inside him: "My son, it is between two wolves. One is evil: Anger, envy, sorrow, regret, greed, arrogance, self-pity, guilt, resentment, inferiority, lies, false pride, superiority and ego. The other is good: Joy, peace, love, hope, serenity, humility, kindness, benevolence, empathy, generosity, truth, compassion and faith." The grandson thought about it and asked his grandfather, "Which wolf wins?" The old Cherokee replied, "The one that I feed." Like the old Cherokee in the story, and like all of us, David had a battle raging inside of him. He asked, "How can a young person stay on the path of purity?" In other words, how can we guarantee that the good wolf will win? In the tug-of-war within every human being, how can we change the odds in favor of good and less in favor of evil? 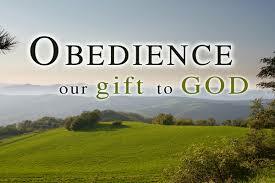 Obedience calls us to challenge and lay aside anything that hinders our walk with God. Instead, we refuse to forsake cherished sin, allowing wrong attitudes to take root and prosper while harmful habits hold us prisoner. The writer of Hebrews offers compelling direction for the captured soul longing to be free. “Let us lay aside every weight, and the sin which so easily ensnares us, and let us run with endurance the race that is set before us.” (Hebrews 12:1) Obedience brings freedom. In the same way, when we follow God's path, he goes with us. His presence with us on the journey is more important than anything else—even the destination. "How good it is to be near God!" (Psalm 73:28). God can see the end of your journey from the beginning, and he will go with you. Until we understand who we are in His eyes, we will never truly be free. Our value and worth rest solely in the fact that we were created, chosen and pursued by God – for God. We belong to Him. His unconditional love sets us free to become all He created us to be which is more than we ever dreamed we could be. In Romans 5:8 the words of Paul celebrate our identity in Him, “But God showed his great love for us by sending Jesus to die for us while we were still sinners.” Recognizing our worth and value to God sets us free from the chains of human expectations and earthly demands. Understanding brings freedom. Christ really has set us free. The question is - are we living in that freedom? Don’t live another day chained to the old ways. Seek His truth, walk in obedience and celebrate your God-created identity! Free – free at last! The Cross established Christ's memorial in the form of Communion. As Jesus celebrated the Last Supper with His disciples, He also began Communion, the First Supper. Communion reminds us of the enormity of our sin, and the generosity of God's grace. Communion reminds us of the price that Jesus paid for the forgiveness of sins. Whenever we receive Communion, we must do so in humility and brokenness before God. We must rejoice and be grateful and thankful for our salvation. This Cross that fulfilled Passover and began Communion has power in our daily lives. When we live under the Cross of Christ, we can say to whatever guilt or shame plaguing us: "Jesus nailed it all to the Cross." When Satan accuses us and reminds us of past sins, we can say, "Jesus nailed it all to the Cross." When we are tempted to think of ourselves as failures, we can remind ourselves that Jesus made us victors when he nailed it to the Cross. Only in the Cross of Christ will we receive power when we are powerless. We will find strength when we are weak. We will experience hope when our situation is hopeless. Only in the Cross is there peace for our troubled hearts. Abraham Lincoln said, 'Most people are about as happy as they make up their minds to be.' If people don't have the right outlook in life, you, and a hundred others like you, won't make them happy. Jesus said, '...In the world you will have tribulation; but be of good cheer, I have overcome the world' (John 16:33 NKJV). As long as you're in this world you'll have problems. Nobody gets a free pass. But don't worry; the Lord's got everything under control. Just learn to be realistic. You will always have to deal with unpleasant situations, stubborn problems and difficult people. But your attitude (not theirs) is what determines whether or not you enjoy life. Sometimes we need to feel inspired and connected; other times we need to simply walk in obedience. As we keep our eyes fixed on the ultimate goal, we will succeed.